Grand Prix Cash Review | Spot The Scams! Binary Options trading is a very popular means of making money online in most developed nations. Even with its popularity, it still goes with a high level of risk. The gap between methodically making and losing a lot of money is very small. The online money market is very volatile and unpredictable. This has given rise to the necessity of finding ways to considerably narrow down the risk involved in trading. The search has led to a proliferation of so many gurus, experts, specialists, software and systems. These options are so many that another great problem then arises. The problem is that of knowing which of the options are legitimate and which ones are scams. Grand Prix Cash trading system is among the many options available for traders to choose from. This article is intended to review the ‘high promising’ app so you can make an informed decision. You will be better informed on whether to invest your time and money or not on the system by the time you finish reading the article. What Is Grand Prix Cash? 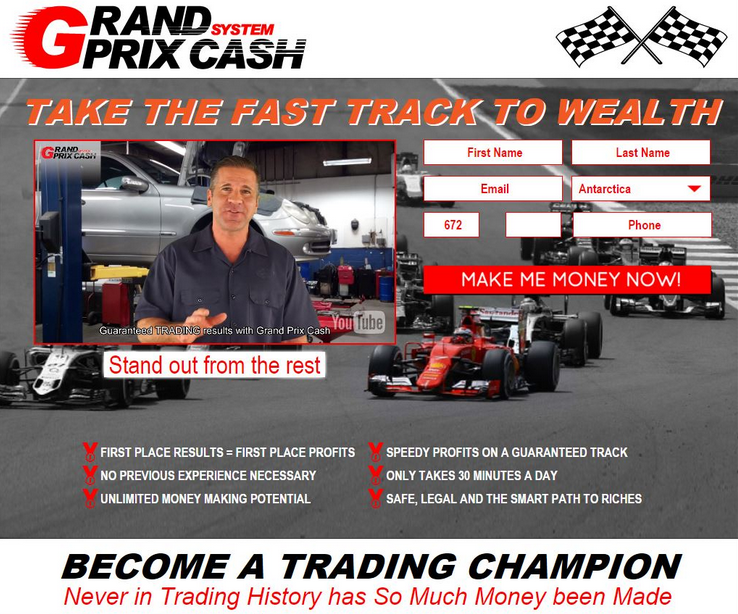 Developed by a so called ‘Bill Evans’ and launched into the trading market around March 2016, Grand Prix Cash System is an automated and web based binary trading system software. The developers claim to use robots which are specialized to binary options trading to minimize your market risks and help you make huge profits. The software allegedly brings your trading risks to the barest minimum by predicting outcomes based on market movements. This the developers say is to meet the requirements of both beginning and experienced traders since, all a trader needs do is just follow instructions and the software does the rest. Even though these all sound nice in addition to the software’s professional looking website, there are some major issues that raise some concerns when one closely scrutinizes the software. The website does not provide any information whatsoever concerning whether the software is licensed and regulated or not. It is common knowledge that trading app sites that do not present this information are normally not licensed and regulated. So, it will not be wrong if one assumes the Grand Prix Cash falls under the same category. This and many more are some of the issues of concern that were observed concerning the software that promises all types of traders heaven on earth. Grand Prix Cash Main Page, Seem Legit Right? Not. “Buy yourself nothing less than a Ferrari!” This is the major cliché which the video uses to try and convince traders to sign up to the software. When scrutinized closely, a lot of things about the video seem not to be right. The clip begins with ‘Bill Evans’ (The supposed CEO) in front of a car that is raised up in a garage. He promises in the clip that you do not need any prior experience for the safe, smart and legal path to super riches to take you through the race of your entire life. For starters, just think of what connects binary options trading to car racing or advertising any binary trading software in a garage in the first place. This is just one among many things that raise concerns in the video. The CEO: Bill Evans (The supposed CEO) claims to be an online trader and a lead mechanic in the video. He claims the he and his diagnostic programmer at the custom garage named Darren, have developed a simple performance-boosting binary options trading program. He said the program surely optimized actual trading execution and generated consistent huge returns. Well, what most people do not know is that our ‘Mr. Bill Evans’ the supposed ‘CEO’ is just another paid actor. This shows how far some online binary trading software platforms can go just to get unsuspecting traders to sign up. Testimonials in the Video: The identities of all those that gave testimonies in the video presentation are all fake. This should not be surprising considering that it does not look like our ‘CEO’ has anything to do with binary trading or software development. The fake testimonial authors are of the same stock with Bill Evans. In fact, it is quite possible that he was contracted to hire them to complete the presentation act. You can expose all of them in just some few minutes if you will scrutinize their identities very well. Just visit the fiverr.com micro-job site and perform a search for the term ‘testimonials’. What you are going to discover will really amaze you. A lot of other reviews have discussed the software’s website and raised so many issues. But the most pertinent that this article wants to point out is that some business vitals are missing from the site. There is no convincing proof of any gains or profits anywhere on the site. A system that has made people ‘huge profits’ like the software promises should at least carry proof of some of such earners on its site. It can even make it authentic by linking to the social media accounts of such members. This is to enable anybody who is in doubt to personally contact them and ask questions. The second observation is that the software claims to be sponsored by many big names like Yahoo, London Stock Exchange, Thompson Reuters, ‘Financial Times’ and so on. The concern here is that none of these big names and brands has ever written anything anywhere concerning the Grand Prix Cash System. They have never recommended the software either. This makes the ‘sponsorship’ claims beat one’s logic and imagination. The badges pasted on the site must be fabricated ‘endorsement badges’ then. They must have being designed to portray the software as being legitimate to innocent traders. Some of the promises made by the Grand Prix Cash System just seem too outrageous. They are very hard to believe. The promises beat the human imagination. Granted, auto binary options trading robots are supposed to get you on to profitable winning ways. But when any software begins to make certain promises that can hardly be conceived by the human mind, then, something must be fishy. Some of the promises can hardly be fulfilled. This is a fact that even inexperienced traders should be able to notice. Experience: Our ‘CEO’ in the video presentation claims that you do not need any experience to use the system for making huge profits. Everyone knows that the trading market is not for everybody. Even if as a newcomer, you do not have any trading experience, you need at least a working knowledge of market terminologies before you can start trading. Wouldn’t it have been better if the clip said you can learn if you are inexperienced? We know that for every new business venture, one has to start somewhere. But it takes some time and some level of experience for one to begin seeing real profits. Profits: The ‘CEO’ claims in the video clip that with your investment of just $250 when you sign up, you can begin earning a six figure income in no time by using the system. This can hardly be possible. Even though online financial markets are among the most lucrative businesses one can partake in, many factors combine to determine the investor’s potential general profits. These factors include money management strategies, budget and experience level. Therefore, it is hardly true that you can begin making a six figure income just by using any software for that matter. German Grand Prix Trip: The ‘software developer’ also claims that once you are signed up and hit the $200,000 mark in no time as promised, then you will have the opportunity of getting a one week all-expense-paid trip to the German Grand Prix Finale. This offer should sound and look stupid even to a common layman. Why should anybody or a business for that matter give you such a vacation? This is not even considering the fact that such a business has already helped you to make a $200,000 profit in just a few weeks. This offer just seems not to make sense. It looks like a ploy just to get people to sign up to the platform. Well, the software can make all the promises it feels like making. After all, you will hardly ever be able to make that kind of money at all. Training Sessions: Training sessions are among the promises made for beginners as well as established traders. The first issue is that; is any training session necessary if the software does not require any experience at all? The video clip said all you need do is follow instructions. Is the training then aimed at teaching you how to follow instructions? The second issue is that nowhere on the software’s website was a demo account presented. We all know that the best way to train inexperienced traders is through demo accounts. It is the only training method that allows them to practice all the failures with virtual money before going for the ‘real thing’. These are some of the concerns which were noticed with the Grand Prix Cash System. It is the necessity for having a means to narrow down risk levels in binary options trading that has brought about many apps showing lots of issues and concerns like this. Management of Risk Levels: Option Robot uses risk management systems like Fibonacci, Classic, Martingale system and so on to regulate investment risk levels for its various users. It uses the management systems to ensure that the level of risk which every investment tool it deals on is regulated and controlled. Repute: The Option Robot trading system has been actually tested and used by many real traders. Such traders have modestly testified to what they have gained from the use. This is unlike the fake testimonials we find on most software’s websites. This sincere appraisal has led to the prime software being recognized. One of such recognition is the “Best Auto-Trading Software 2016” award which Option Robot won not long ago. Clarity: The way Option Robot was built and its ease of use are some of its features which you will love very much. The transparency level of all the information contained on the system’s website is hard to come by in the niche. The software has a huge database of information in form of FAQs and a knowledgebase. This huge database is surely enough to make you the best binary options trader you can be. Finally, you will discover that Option Robot does not make inconceivable claims like many other systems just looking to get traders signed up. Its website contains only testimonials, rating and feedback that are genuinely given by real persons. They are given by real persons that have made real profits. They made the profits just as moderately promised by the trading system. What’s more, the website even links to the social media accounts of such users. This is to enable those that might be in doubt to contact them personally. That is if they want to verify any of the posted testimonies, ratings or feedback. Options Robot is one simple and easy-to-use binary option trading software but it always delivers desired outcomes at all times. With the volatile and unpredictable nature of online money markets, you need a means of truly reducing the risk of being a loser whenever you trade. If you try Option Robot in such a situation, then you will understand why you do not need any other trading software.